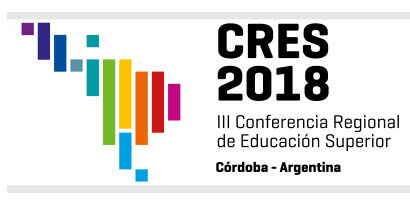 Prior to the Third Regional Conference on Higher Education for Latin America and the Caribbean, CRES 2018, to be held at Universidad Nacional de Córdoba (Córdoba, Argentina) from June 11th to 15th, the World Confederation of Education (COMED), in support of this important international event in the field of higher education, invites all those interested to participate in it with the idea of contributing to the constant task of expanding and guaranteeing the right to Higher Education, understanding it as a social and public good that our societies should promote and treasure. On this occasion, UNESCO, through the Institute of Higher Education for Latin America and the Caribbean (IESALC-UNESCO), has chosen to organize the third edition of this Conference together with Universidad Nacional de Córdoba, National Interuniversity Council (CIN) ), Council of Rectors of Private Universities (CRUP) and Secretary of University Policies of the Argentine National Ministry of Education, within the framework of the celebration of the Centennial of the University Reform of Córdoba. CRES 2018 is a unique opportunity to rethink and come up with proposals for the enormous challenges faced by the region in terms of Higher Education, a hundred years after the University Reformation and after the 10-year reform of CRES 2008, held in Cartagena de Indias, where the continent defined and defended Higher Education as a human and universal right, a public and social good.